Summary: Light rain tomorrow, with high temperatures rising to 79° on Sunday. 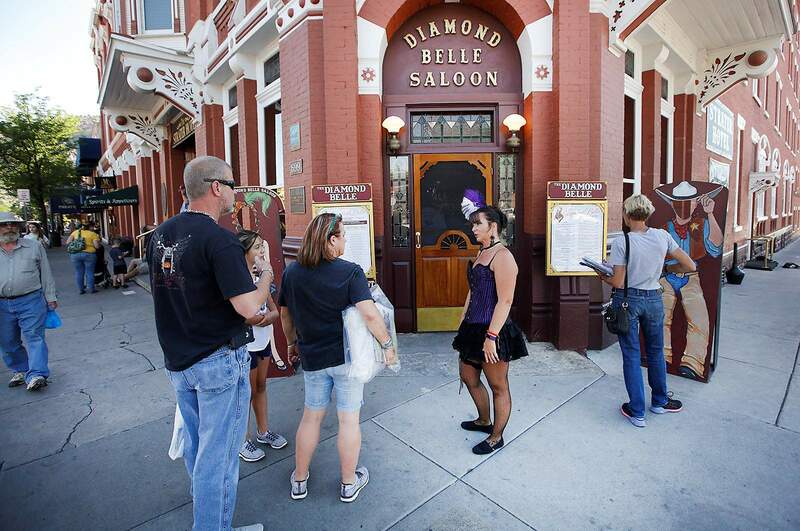 Cassi Romine, with the Diamond Belle Saloon in the Strater Hotel, lets Tom and Karen Shupe, with their daughter Shelby Shupe, all from Austin, know that the saloon is family friendly during their stop in Durango. 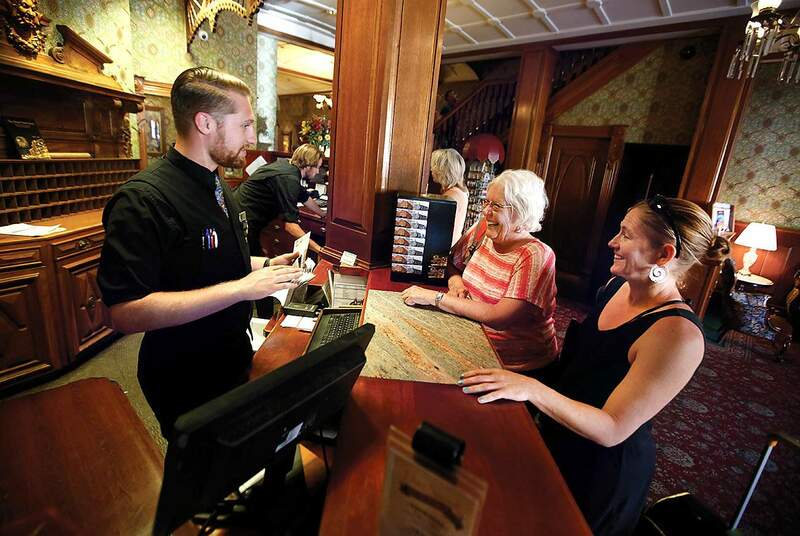 Austin Daigle, with the Strater Hotel, checks-in Kathy Shinkle and her daughter, Ellen Shinkle, on Monday. Tori Ossola, rooms division manager at the Strater Hotel, estimates the inn’s sales are down close to 40 percent this June compared with June 2017. Few if any retail businesses in Durango managed to escape the absence of tourists stemming from the 416 Fire and the cancellation of train runs to Silverton. Ossola estimated this June’s sales are close to 40 percent down from June 2017, and room rates were reduced. In addition, last week when the smoke from the fire was particularly bad, Ossola said they received a few cancellations from people with respiratory problems, and even a few people who live at low altitudes were expressing concern about air quality. On the positive side, she said employees of the hotel opened up their homes to other employees who had been evacuated. “There was real sense of community and compassion that came from our corner of Main Avenue,” she said. July bookings are returning to a more seasonal rate, she added. Gary Cook, an entertainer and co-owner of the Bar D Chuckwagon, said he estimates sales at the supper and entertainment venue are down 25 percent compared with June 2017. “We’re down, like everyone involved in tourism, I’m sure,” he said. “We didn’t have to close down this time, but we’ve had some small crowds,” he said, noting that the 2002 Missionary Ridge Fire burned all around the Bar D Chuckwagon, and he and another Bar D Chuckwagon owner lost their houses to that blaze. The Bar D Chuckwagon is celebrating its 50th anniversary and has several special guests visiting to celebrate, including Charlie Daniels who preformed Monday, and he said the show was sold out. Roger Zalneraitis, executive director of the La Plata Economic Development Alliance, said after talking with businesses, he is confident the economic loss from the 416 Fire is in excess of $1 million, and he said it was probably $2 million or more when factoring in La Plata County and San Juan County. A better idea of the economic harm will emerge, he said, when sales tax, lodgers tax, and real estate sales numbers for June and July are available and when unemployment numbers come out from the state of Colorado. Jessica Haydon, manager of Fired Up Pizzeria looked at her half-filled dinning room Monday shortly before 5 p.m. and said, “If the train were running, there wouldn’t be a table available. “We depend on that train more than people know,” she said, adding she schedules shifts at the restaurant based on the D&SNG’s schedule. “Even the small runs they’ve started this week increased our business,” she said. Haydon estimated June sales are about 30 percent down compared with June 2017. Johnna Bronson, owner of lively (a boutique) said locals have been supportive by shopping downtown last week, but she is still down between 10 to 15 percent this month. When the fire first hit, Bronson said her sales weren’t affected because tourists were mulling around downtown looking for other things to do, but when the first wave cleared out “it almost felt like February again” she said of foot traffic. “It does feel like life is coming back and things will get back to normal, but we had one day without sales, and that scared me,” she said. James Allred, owner and general manager of Eolus Bar and Dining, said usually 30 to 35 percent of his customers in summer are tourists, and he estimates his restaurant is down about 15 percent this month compared with June 2017. Do you know someone who has canceled travel plans to Durango because of the 416 Fire?